Danny Rand returns to New York City after 15 years away, but nobody believes him because everyone thinks he’s dead! This is because he and his parents were in a plane that was presumed crashed in the Himalayas. The wreckage and their bodies were never found, and nobody ever showed up to suggest otherwise. Danny’s childhood friends–the children of his parents’ business partners–are the main embodiment of this denial. I can’t remember anyone’s names. We learn from flashbacks that the girl was always nicer than the boy, who was a jerk like his dad. Danny–remembering this–focuses some of his persuasive energy on the girl. Both siblings treat him with hostility, but they have fair reason to. Speaking of people who everyone thinks are dead, we learn that their dad–Danny’s dad’s old business partner–faked his death 10 years ago and now lives in a secret bunker. No explanation as to why. With no friends and a childhood home that is now inhabited by the girl who doesn’t believe he’s alive, Danny tries to make it on the streets of New York. He befriends a poetic hunter-gatherer bum, and he also attempts to get a job at a local martial arts studio. Upon leaving the studio, he’s attacked by goons he recognizes from the Rand building. Some punches and kicks later, he discovers that the jerk boy sent them! Danny continues to work the angle with the girl, remembering that she had a heart. He just wants them to believe it’s really him! Eventually she seems sympathetic…but oops! It was a trick. The evil siblings drug him and appear to get him committed as some kind of mental patient. And that’s all that happens in episode 1! It’s an understandably expository greeting to the series, establishing the characters and the basic premise, giving us enough to know where we stand while leaving a lot of room for the season to unfold. We got to see Danny’s fighting skills, but they didn’t give too much away. I would consider this an unambitious but respectable opening episode from a storyline standpoint. One of the things I despised most about Daredevil was in this category. Foggy and Karen were constantly doing stupid things, and their stupidity caused problems. The drama in the series was so frequently because Matt Murdock surrounded himself with morons. Foggy and Karen spent 95% of the show sulking, pouting and making rash decisions because of how mistreated they felt. Episode 1 of Iron Fist was remarkably refreshing and I sure hope it stays that way. Most of the time was spent on the business siblings. On one hand, we know they have sinister incentive to doubt Danny; he’s the sole heir of the majority owner of the company. But the show also establishes they have real reason to suspect him; the company is about to make a major move into China, and this supposed appearance of the co-owner’s son after 15 years away seems coincidentally timed to disrupt the move. In fairness to the business siblings, how many people who survive Himalayan plane crashes wait 15 years to show up? 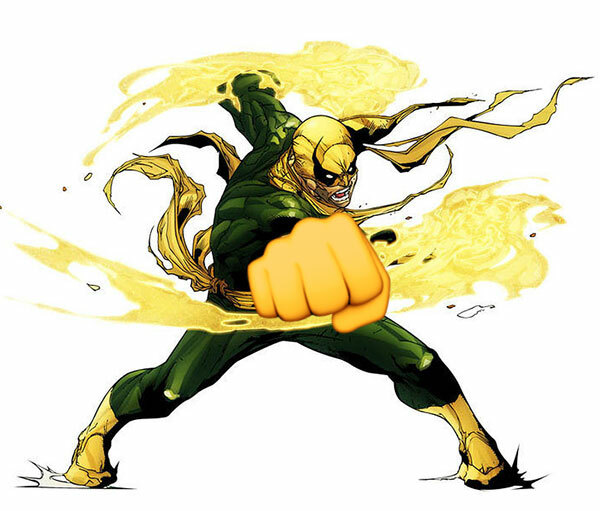 Like the plot, this was another area where I felt like Iron Fist was unambitious, but it knew what it was going for and hit its target, as easy as that may have been. Daredevil is what I would consider to be fake-mature; it has stupid plots, stupid dialogue and stupid characters, but they swear a lot and there’s gore, so it must be mature! Sort of like DC’s cartoon movies. Iron Fist has occasional swearing, but it doesn’t feel nearly as contrived as Daredevil, and so it ends up actually feeling more mature. Watch Daredevil and notice how they wedge some degree of profanity into virtually every sentence, no matter how awkward the fit. Actual mature writers don’t write that way. It all felt natural in Iron Fist, and I hope that’s an indication of Marvel’s Netflix team finding their voice and their groove. Overall, this felt lighter–almost like a CW series–which was refreshing. Danny Rand is portrayed as a much more naive and rainbowy soul than some of his other Netflix counterparts, and something as dark as those would’ve likely made a mess. This balances the lightness of Danny’s scenes with the darkness of mean New York and uses the contrast effectively. This leads me to the characterization of Danny Rand himself, which I thought was one of the most questionable decisions. Beyond being a white guy, Danny always contrasted the humorless rigidity of martial arts stereotypes by being a little more reckless and unconventional, but when the situation called for it, he could pull it together with the best of them and play by the rules he likes to break. This version of Danny is contrasted with the humorless stereotype of martial arts by basically being a trust-fund hippie. He’s every frat guy you knew in college who listened to Dave Matthews and Jack Johnson and wore a coral-shell necklace. He slips in and out of his martial arts not by focusing and hardening like comic-book Danny Rand, but by flowing and letting his body sweep along with what feels to almost be an external fluidity. I don’t want to overstate the issue, because while the difference between presentations of Danny is notable, it’s a difference that they appear to be thoughtful about. That different presentation is paired with an appropriate manifestation of his fighting style, so there’s at least consistency to that characterization. Two un-clenched thumbs up to that. What fell flat for me was that Danny was also presented as someone who was struggling with some kind of PTSD, often seeming unable to hold it together when faced with flashbacks of the plane crash. That is understandable, except for the fact that we are seeing Danny after his time in K’un Lun–after he supposedly became the heir to the Iron Fist. So he really should have it together! Right now I can’t tell if they were just adding that drama to work in flashbacks to tell his backstory, or if there’s a reason that the champion of K’un Lun seems pretty weak and unstable when back in New York. Overall, I was pleasantly surprised given all the venom spewed at this show. As I mentioned to Doom DeLuise upon finishing episode 1, I don’t know if I’d necessarily say it’s good, but I enjoyed it. It aimed low but hit its mark, and it felt much more comfortable in its own skin than some of its Netflix predecessors. 1. Why did business-partner dad fake his death? 2. What’s up with that bum’s bird tattoo? 3. Did the bum overdose, or did someone overdose him to make it look like an accident? 4. We already saw that the evil business twins were not above sending would-be assassins after Danny, so why didn’t they just kill him when he fell victim to their poison? Thinking about this a little more — I bet they took Danny Rand in the direction they did because otherwise, if he’s a cocky “I make my own rules” rich funny guy, he’s going to just feel like a Tony Stark ripoff. I like that confident version of Danny Rand in the comics, but I can see why they made this choice. The differentiation is probably a good call. The tone feels a lot different, and with Batman, at least some people welcomed him back, even if some didn’t. Here, it’s like he has nobody and no proof he is even himself. So there’s a different challenge ahead of him, even though a lot of the elements are pretty similar. He’s not trying to claim his throne at the company — he just wants to be home. But the business siblings are so paranoid about the business that they assume he’s solely a business threat. And that’s on top of the fact that they don’t believe him — at least initially. Eventually it’s clear there’s going to be incentive to refuse to believe him, no matter how compelling he ends up being. The bum was my favorite character. I won’t spoil the surprise that he’s actually dead and doesn’t get to come back as Danny’s comedy relief sidekick. Episode One could have used more Punisher in strip clubs, especially since it had none. Question 1 will be answered. Sadly, questions 2 and 3 will not. I’d kind of forgotten about that bum by the end of my viewing and this leads me to believe that the screen time devoted to the bum and his death could have been better served developing some other aspects of the story. What did those scenes accomplish? What did they tell us about Danny’s character? How did they progress the story? Question 4 has a couple false assumptions. First, the siblings aren’t twins but I think you’re just giving them a funny name and to your credit, evil business twins is pretty good. Second, only Ward (Wade? no. Ward) is willing to kill Danny. Joy is not and so we can assume that he convinced her to poison Danny for his own good. Let’s keep these reviews coming. I’ve got things to say in the comments!